COLLEGE STATION, Texas (AP) — Thousands waved and cheered along the route as funeral train No. 4141 — for the 41st president — carried George H.W. Bush’s remains to their final resting place on Thursday, his last journey as a week of national remembrance took on a decidedly personal feel in an emotional home state farewell. “The world became a better place because George Bush occupied the White House for four years,” said Baker. As the post-funeral motorcade carrying Bush’s remains later sped down a closed highway from the church to the train station, construction workers on all levels of an unfinished building paused to watch. A man sitting on a Ferris wheel near the aquarium waved. Bush’s body was later loaded onto a special train fitted with clear sides so people could catch a glimpse of the casket as it rumbled by. The train traveled about 70 miles — the first presidential funeral train journey since Dwight D. Eisenhower’s remains went from Washington to his native Kansas 49 years ago — to the family plot on the grounds of Bush’s presidential library at Texas A&M University. Bush’s final resting place is alongside his wife, Barbara, and Robin Bush, the daughter they lost to leukemia at age 3. “It’s something we’ll always keep,” Allen said. “Hopefully, my children will remember the significance and the meaning of today,” Gordon said. Addison was carrying two small American flags in her hand. About 2,100 cadets in their tan dress uniforms with jackets and ties and knee-high boots waited for hours on a cold, gray day to line the road —known as Barbara Bush Drive— to the Bush library’s front doors. The U.S. Navy conducted a 21 strike fighter flyover, a salute to the World War II Navy pilot, followed by a 21-gun cannon salute on the ground. At the earlier service at Houston’s St. Martin’s Episcopal Church, where Bush and his family regularly worshipped, the choir sang “This is My Country,” which was also sung at Bush’s presidential inauguration in 1989. Those gathered heard a prayer stressing the importance of service and selflessness that the president himself offered for the country at the start of his term. 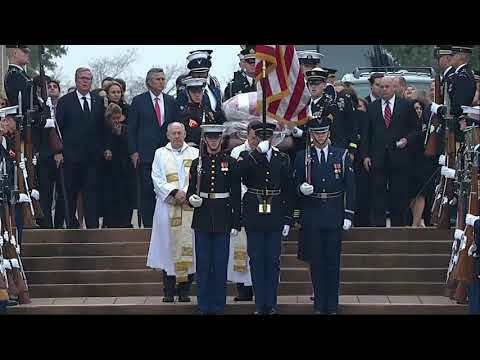 “He left a simple, yet profound legacy to his children, to his grandchildren and to his country: service,” George P. Bush said. The church’s pastor, the Rev. Russell Levenson Jr., recalled the Bushes often attending services and offering to give up their seats to others on days when the church was particularly crowded. President Trump, who once mocked the late president’s “points of light” call to volunteerism, had nothing but favorable words Thursday. The cathedral service in Washington was a tribute to the patriarch of one of the nation’s most powerful political families — they occupied the White House for a dozen years — and to a faded political era that prized military service and public responsibility. Like Baker’s address Thursday, it included indirect comparisons to Trump but was not consumed by them, as speakers focused on Bush’s public life and character — with plenty of cracks about his goofy side, too.